Hiking along the Laurel Highlands Trail (along the top of Laurel Ridge), to an overlook that can see from the 6 miles distance "The Flats" in Ohiopyle State Park, Pennsylvania. The closest trail parking lot to this scenic point is about 3.5 miles, requiring a 7 mile hike through notoriously rocky terrain in western Somerset County, Pennsylvania. This would be my first hike on this segment of the Laurel Highlands Trail. After a long drive I arrived at Normalville, PA where I ate lunch at Subway. From there I took Route 653 east, which headed down in elevation to the base of Laurel Ridge. After climbing several miles and thousand feet in elevation, I took a road that branches off to the right and drove that several miles until I reached Maple Summit Road. I was anxious about the condition of this mountain road, but found it was at least paved. Soon after sighting the PA State Game Land 111 welcome sign, I found the parking lot for the trail on the left side of the road where I joined two cars already parked there. Despite a very cool morning, I was disappointed to find the distant mountains very hazy on my commute. I'm not sure if this were humidity, which wasn't noticeable, or if the stagnate air didn't allow the pollution to escape. The temperature was a comfortable 68 degrees with a calm wind. The sky had a hazy cast, and clouds were clinging above the Laurel Ridge. I verified with a hiker that this was the Maple Summit Road trail head before beginning what I knew would be a long hike, at least by my standards. I checked the time and it was about 2 PM, giving me five and half hours before nightfall. Given my Subway lunch, I only packed an apple and two containers of water along with what felt like 20 pounds of camera equipment. With my back pack loaded, I began the hike. After a small trail leading from the parking lot, I headed south right before crossing Maple Summit Road. Feeling anxious to see these overlooks, I began my hike at a fast pace. The Laurel Highlands Trail is a renowned ankle bender, as its pathway contains numerous rocks and tree roots. After making some distance from the road, the beauty of Laurel Ridge came out in full force. 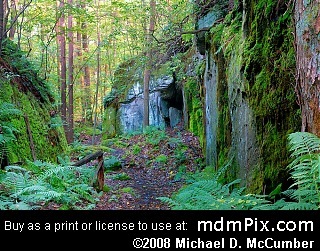 The forest floor was lined with ferns and green moss covered the limestone rock outcroppings. Given the calm winds, birds along the forest canopy can be heard for miles. Early in my hike some bands of wild flowers cast a heavy fragrance to the air, but further in the dark forest only pine and moist moss can be smelled. After about a mile of fast paced hiking, I painstakingly passed two hikers loaded heavy with camping gear and continued speedily until my lungs demanded a slower pace. It was about that point that I heard a loud flow of water, surprising given the elevation (streams begin here and thus are usually small) and how dry the past two months had been. Dropping in elevation I entered a grove of Eastern Hemlocks flush with a fresh pine like scent and crossed the stream Little Glade Run. "I'll have to take pictures here on the return trip" I thought as I crossed a wood log bridge and began an ascent up out of the stream's gorge. In less than another mile after some elevation climbing I reached an impressive outcropping of limestone several stories tall with walkway corridors between enormous blocks of stone. At this point the sun had broken through some of the clouds and cast some harsh shadows on the floor, thus I left my camera stowed away in my back pack. I climbed my way through a corridor in the rock looking for a way to climb up a perhaps three story high section of limestone for I believe the top would enjoy a marvelous view to the southwest. I only spared a few minutes before I was back on the trail, by now keeping alert for any scenic overlooks that might emerge to my right (west). Nearing a spot marked as a scenic overlook roughly 2.3 miles, I noticed a scenic overlook that appears to have been grown in with trees. Now fearful that my destination too might have grown in completely, I picked up the pace again and after a long while I reached the mile marker "8" (meaning 8 miles from the trail's start at Ohiopyle, Pennsylvania). According to the map, the scenic overlook was just south of mile marker 8, but reality proved different. I'm guessing another quarter of a mile brought me to my final destination, and my legs, ankles, and feet felt relieved to get a break. Through the forest canopy I could see a break and there after emerging off the trail through some vicious green briers, I came out to a rocky outcropping where sure enough I could see the Youghiogheny Gorge some five or six miles distant. The high I felt at reaching this beautiful spot diminished quickly due to two issues: the sun was between me and the scene, thus the picture quality on even a clear day would be lacking. And the hazy conditions were far worse than I could have ever imagined. Nonetheless, after eating my apple and drinking down a container of water I got my camera out and setup my tripod. I explored around the rock outcropping to find the best vantage point for the trees were cutting the view off at the bottom in many places. I snapped several pictures before reaching into my bag for a neutral density filter. While the distant scene was dark and shaded by some clouds, the spot I was in was in full sun. The filter, hopefully, would even the two odds out a bit. It did help. About that time the hiker I hitherto verified the road's name, a Somerset County, Pennsylvania native, emerged from the forest. We both lamented the hazy conditions and then discussed some of the other overlooks before he headed back to the trail head. I relaxed there a bit enjoying the scene and the endless row of mountain ridges before me, and while watched a hawk soar overhead before I gathered my backpack and began the hike back. For this leg of the journey, my camera was out and ready. Ferns, endless ferns, but how to capture them without the scene being too busy was a thought I had upon reentry under the forest canopy. Then I found a very shaded spot with a fern kind of standing up in front of the others. Unfortunately, I walked by without taking any pictures of the largest limestone rock formation. The one I had earlier climbed around to find a way to the top. I was anxious to get a little closer to the car for the forest around me began to grow noticeably more dark. Not long after that I reached a bright opening in the forest and photographed a partially sun drenched wall of limestone rock at an area I believe had the highest elevation for this segment of the trail. A descent was made from here and this is where I took probably the best pictures of the day, at yet another impressive blue limestone rock formation this one being up to two stories in height, and evenly dark making the choice in exposure settings easy. The exposures there were between 20 and 30 seconds long. After some additional distance, I found one of the Laurel Highlands Trail's trademark log bridges that crossed a stagnant pool of water. Then nearing the largest stream on the trek, Little Glade Run, a macro scene around the base of a large tree truck caught my eye. While unnerved by the sound of a dog in the distance, I captured several pictures before stopping yet again this time for some ferns. Near a grove of dark shade casting Eastern Hemlocks was a beautiful tree trunk covered in moss with some large vibrant ferns before it. I took several pictures of the bright ferns and tree trunk with a dark shaded background. That proved to be the end of my picture taking for the day. I had planned to capture that Little Glade Run, but there was a horse-sized dog left loose by some irresponsible dog owners that would have made any 30 second long photography exposures impossible, and besides those people were also sprawled out all over the place. I took solace in knowing that this exquisite stream is only 1.25 miles away from the parking lot. Before leaving this beautiful wilderness, I rested on a perfect log for sitting for about 10 minutes taking in the sights, scents, and sounds of the darkening forest around me. Tired, for I hadn't hiked much in recent months, and now hungry I finally headed back towards the distant road. Upon reaching the road and with my feet sore I opted to take the flat road instead of the side trail leading to the parking lot. Upon reaching my car I munched on the first salty snack I could find, the leftover Sun Chips from my Subway lunch. The drive down the mountain entailed a very bright sun shining head on, until I fell below it in the valley only to emerge into the light again once on top of Chestnut Ridge nearing Connellsville, Pennsylvania. The evening light was beautiful and would have made for some great picture taking, but I was feeling far too worn out for that. shareShare this Page "mdmPix.com: September 20, 2008"